Heading into ownership change now owned by the Egg Harbor Group, Silverton presents its first new models. The 43 Convertible is an update to the old model with the same designation but now features a revamp to the exterior which makes it a more cruiser friendly looker, with four large cabin windows featured in the lower deck. But do not get delusional the 43 Convertible still features sport fisherman amenities as the free aft deck, the center console bridge, a nice range thanks to large short of two thousand liters fuel capacity, which with not much horse power should give interesting nautical miles. The layout plan of the 43 Convertible features two double cabin sleeping four below, a spacious shower head, C-shaped galley all located below. The main deck offers an L-shaped sofa, C-shaped dinette, and an entertainment unit center to port side. 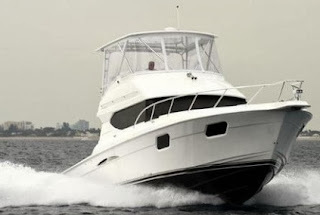 Power is twin Yanmar 440hp or option 480 units.